Query the server only for the date and time of the last incremental backup, and process only a fraction of the data processed by the Incremental (complete) backup. Do not recognize any files as ever being deleted from your machine, and no version expiration ever takes place. (That is, there are no "active" or "inactive" versions.) As a result, no files are ever removed from the server, and you can quickly run out of storage space. 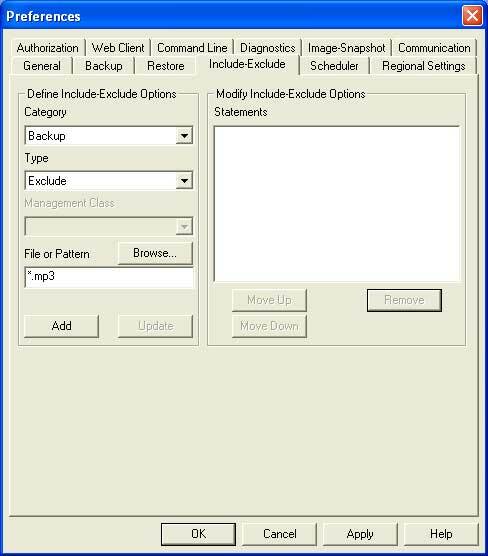 In order for your files to be included in the scheduled backups and archives, you must have the Scheduler running as a Windows NT/2000/XP service. When you start the service, it continuously polls the server for scheduled events, and it continues to run and start these scheduled events until you stop the Scheduler. To automatically start the scheduler, Open the Start menu, select Programs, then Tivoli Storage Manager, and finally Backup Archive GUI. From the TSM window that appears, pull down the Utilities menu, and select the Setup Wizard option. Deselect "Help me configure the TSM Backup Archive Client" and select "Help me configure the TSM Client Scheduler". Click Next to continue. The Tivoli Scheduler Wizard window will appear. Select "Install a new or additional scheduler" option and click Next to continue. 4. 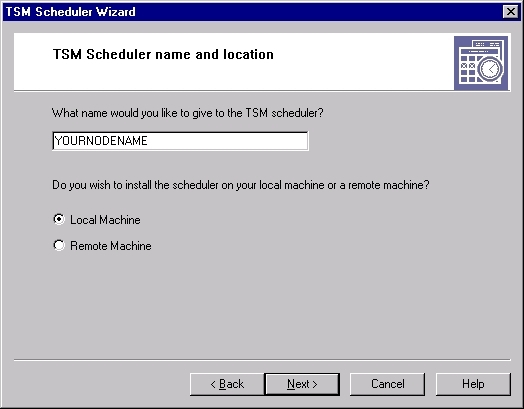 Enter YOURNODENAME in the "What name would you like to give to the TSM scheduler?" text field, and click Next to continue. 5. When the "Option File name and location" window appears, accept the default option file and click Next to continue. The following window will appear. Enter your node name in the " What is the TSM node name to use?" 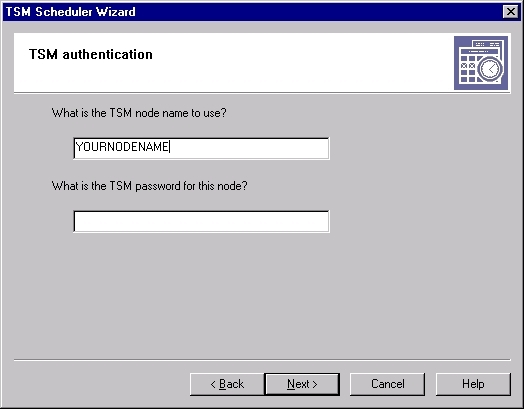 text field and enter your TSM password in the "What is the TSM password for this node?". 7. The following window will appear. 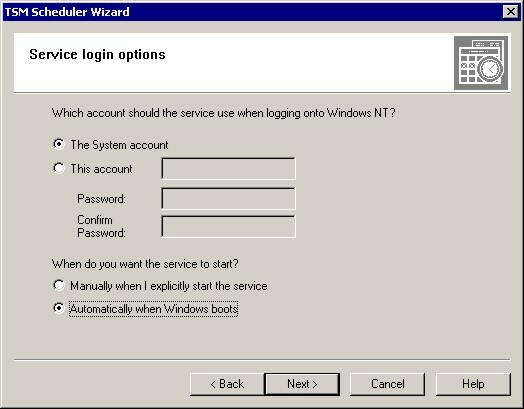 Accept the default system account, and select the "Automatically when Windows boots" option in the "When do you want the service to start?" field. Click Next to continue. 8. The "Log File name and location" window will appear; accept the default schedule and error log names. Click Next to continue. When the "Completing the TSM Client Configuration Wizard" window appears, click Finish . In order to stop the service, you use the Services Control Panel. To use the Services Control Panel, click on Start and scroll up to Settings . Next click on Control Panel . Click on the Services icon. Once the Services window opens, look for your node name. Click on your node name and then click on the Stop button. To use the Services Control Panel, click on Start and scroll up to Control Panel . Click on Administrative Tools . Open the Start menu, and select the Find option. From the pop-up sub-menu that appears, select the Files or Folders... option. A separate Find: All Files window will appear. If the system locates the specified file, the filename will appear in the field at the bottom of the Find: All Files window. Double-click on the file's icon, and the file's contents should appear in an editor such as Notepad or WordPad. Open the Start menu, and select the Search option. If the system locates the specified file, the filename will appear in the window to the right of the Search for Files and folders window. Double-click on the file's icon, and the file's contents should appear in an editor such as Notepad or WordPad. Open the Start menu, select Programs, then Tivoli Storage Manager, and finally Backup Archive GUI . From the TSM window that appears, select the Backup option. A separate Backup window will appear; in the drop-down box located to the left of the Help button, make sure the Incremental (complete) option is selected ( not the Incremental (date only) option). Note: If you want to backup only a selected folder click on the plus sign next to the folder. If you want to backup a specific file, click the plus sign next to the folder where the file is stored. The individual files within that folder will now appear in the right pane. Click on the gray box to the left of the file. Eventually, the following window should appear on the screen, signaling the successful completion of the backup. You should now have a complete backup of all the specified files/directories on your machine's hard drive. If you have files with extensions such as .exe, .zip or .MP3 on your PC, these files are already compressed, and will not be compressed further when they are backed up to the TSM server. Many compressed files such as MPEG, JPG and MP3 may even take up more space on the EZ-Snapshot server than they do on your hard drive. All files are compressed on the client system prior to sending them to the EZ-Snapshot server. If a file is already compress, it may become larger after the compression algorithm is run. There is no way to turn off the compression that EZ-Snapshot uses before backing up files. Open the Start menu, select Programs , then Tivoli Storage Manager and finally Backup Archive GUI. If you are prompted to login, enter your EZ-Snapshot password. From the TSM window that appears, pull down the Edit menu and select Preferences. Click on the Include-Exclude tab. Under Category, select Backup. Under Type, select Exclude. For each type of compressed file you wish to exclude from your backups, type an "*" followed by the file extension (e.g. "*.mp3", "*.avi", "*.mpg") and click Add. You must enter only one file extension at a time, as shown below. Your backup data is stored by disk or filespace. Backup files can be deleted for entire filespaces only. It is not possible to remove backup files for individual files or portions of filespaces. If you wish to have backup data for old disks removed, you can send e-mail to ezsnap-support@rpi.edu requesting that the data for a file system be removed. Please include your node name in the email. Remember that individuals are billed in 5GB allocation increments and departments are billed in 100GB allocation increments. As each 5GB or 100GB allocation is exceeded you will be billed in the month during which your storage allocation was exceeded. The charge will not be prorated. Therefore, reducing your storage usage on the server after you have been billed for an storage allocation increment will not result in a refund of any prior charges. You can check your storage allocation usage by going to your RCS User Profile Manager , login to your RCS account and click on the EZ-Snapshot tab. If you've backed up files and need to restore them, open the Start menu, select Programs, then Tivoli Storage Manager , and finally Backup Archive GUI. 1. Select the Restore option from the TSM window that appears, as shown below. The Tivoli Storage Manager Restore window will appear, as shown below. On the left side of the window, you will see a tree of folders. On the right side of the window, you will see a list of files (or a blank screen if there are no files in the folder you have selected). To display the folders and files you have on your harddrive (C:), click the sign to the left of File Level , then click the sign to the left of the entry with (C:) in parenthesis to the right of your computer name. For example \\helpdesk-t30\c$ (C:). You should now see a list of folders on your harddrive. To show the subfolders, click the sign to the left of a folder. To select an entire folder to be restored, click the grey box to the left of the folder. You will now see a indicating that folder is now selected to be restored. 3. Click Restore. 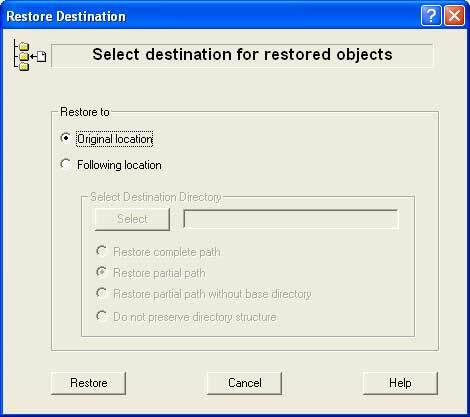 The Restore Destination window will appear, as shown below. 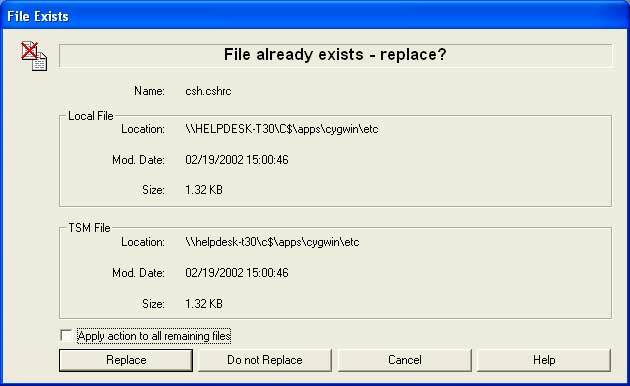 During the restoration, a File Exists window may appear, as shown below. This indicates that there is already a file with the same name as the one you are trying to restore. If you would like to delete the file on your hard drive and restore the one you backed up on the server, click Replace. If you would like to keep the file on your hard drive and not restore the one you backed up on the server, click Do not Replace. A window will appear on the screen signaling the successful completion of the restore.